Build a new future today! Together, we build because everyone deserves a decent place to live. By supporting the families who benefit from our programs, you stand alongside them as they learn to stand on their own. Heather applied to create a legacy for her two developmentally disabled children. 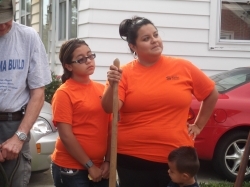 Janelle built with us to fulfill her dream of owning her own home. Sylvester & Anne applied in order to continue to live safely in their home as they aged. Shatara partnered with us to ensure her daughter has a safe place to grow up. Your investment in Janelle, Heather, Sylvester & Anne, and Shatara ensures that they and many others will have a healthier and more stable future for themselves and their children. This year, your support will provide strength, stability and self-reliance to 10 Future Homeowners as well as 42 existing homeowners through Home Repair Ministry. Everyone needs a foundation to build a future. Your gift will help provide materials like a window, a roof, or a kitchen sink. But you are building more than a home: You are providing a better future. Stable housing results in our homeowners and partner families saving more, investing in education, aging in place, and experiencing a healthier life. Next to the monetary needs of building Habitat homes, our greatest challenge is finding land on which to build, and homes to purchase for rehab purposes. Therefore, Maumee Valley Habitat for Humanity is continually working to identify property as a future home site. With your help, you may be helping us meet the first critical step in making sure a deserving family in our community can build a permanent home. Donate Now Every donation to Habitat for Humanity strengthens our ability to ensure everyone in Lucas County (and around the world) has a decent place to live. Maumee Valley Habitat for Humanity is a recipient of Kroger Community Rewards (NPO #83869) and Amazon Smiles donations. Every purchase builds a better life. Want to give even more in the future? Planned Giving is a lasting expression of who you are and what mattered to you in your lifetime. The most common way to create a legacy is through a bequest gift in your will. You can also consider making a planned gift through an insurance policy, stock transfer or gift annuity. Contact us to learn more about how Planned Giving can change a family's future. Make a difference in the community in which you and your employees or members live and work by being a Sponsor for a build, a repair project, or all of our projects through a Mission Partnership. Partnering with Habitat for Humanity is a great way to provide team building and community engagement. Sponsoring a build or a day will be recognized in many ways and be modified to meet your community outreach efforts. Contact us to learn more about how your business or organization can build strength, stability and self-reliance for one of Future Homeowners or repair Partner Families. Cars Through Habitat for Humanity’s Cars for Homes program, you can donate a car, truck, boat or RV to support families here in Lucas County. Please be sure to designate Maumee Valley Habitat for Humanity as the recipient of the donation. Building Materials We accept new or gently used materials from retail outlets, contractors and homeowners. Some items can be used to build or repair homes. Other items will be sold in ReStore to support these programs. To donate to ReStore, visit our donate to ReStore page. Land or Houses We are always searching for buildable lots and houses we can rehab. Contact us to tell us about land or home you are interested in donating. Have a used refrigerator or set of cabinets you'd like to transform into safe and affordable housing? All donated items are sold in our public retail outlet, ReStore. All profits from ReStore are used to support our Homeownership Program and Home Repair Ministry. And by donating to ReStore, you are also kinder to the environment. For every $1 in ReStore sales, 1.6 lbs. of waste materials is kept from a landfill. To donate to ReStore, visit our donate to ReStore page. Have another idea of how you or your organization can provide a building block for a child’s future? Then please contact us!